Next generation fire sprinkler system estimating software. We designed our software from the ground up with only one thing in mind, generating fast and accurate estimates for fire sprinkler systems. Unlike typical spreadsheet systems, FireMate 451 runs in the cloud and leverages powerful database functionality, allowing us to provide unique features you just can't get with any spreadsheet system, such as automatic cost updating, dynamic assemblies and templates, and more. ... with more being added all the time. Modify the default price book, or import your own. Create and modify assemblies and project templates. Customize your project phase names and rate categories. It&apos;s that simple. Keep your price book safe and secure by hosting it on your own database server, that only you can access. We&apos;ll help you get it set up and ready to price. Easily update item prices everywhere by modifying the dynamic price book. Lock items from being updated within a job by clicking the padlock next to it in the pickoff. Since FireMate is a web application, you can access it from any computer that can access the internet. You do not need to return to the office to do an estimate. With FireMate it&apos;s easy to stay connected. Email employees invitations to your company&apos;s portal, and grant them admin or estimator-only access. With a scalable system like this, it&apos;s easy to keep growing your company. Use templates to jump start your job pickoff. They will import reminder lists for estimating the project. Just scroll through the items and set the quantities to include them. © Associates Engineering Systems, LLC. All rights reserved. Customize your default company settings. Configure up to 5 different types of pricing categories for your items. Manage your default rates, overhead, and markup. Configure up to 9 different phases for your jobs. Easily send out email invitations to your employees to get their account registered. Manage your employees and account types from the administration panel. Build, import, and manage your price book from within the system. Build and manage templates for your jobs. 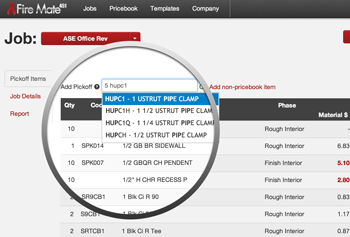 Use intelligent search and autocomplete to add items to your pickoff from your price book. Preview on-screen reports that include aggregate calculations, as well as break downs by job phase. Printer-friendly, professional PDFs can be generated at any time.